MongoDB is an open source and cross platform NoSQL database. MongoDB allows you to store data in the form of documents. MongoDB documents are stored in JSON format. A document holds the data in the form of key-value pairs. They are called fields. A set of documents is called a collection. A collection can contain different types of documents. A database can contain one or more collections. When you add a new document to the database, by default MongoDB adds _id field to it that acts like a primary key. By default _id is set to an ObjectId but you can assign any other unique value to it. 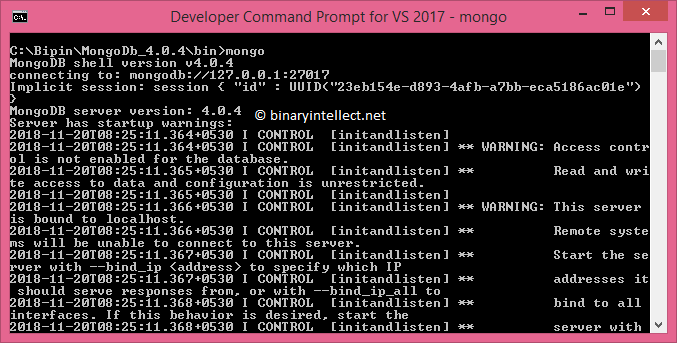 Ok. Now that you have basic idea of what MongoDB is let's see how you can install it on Windows. Go here and download either the MSI package or ZIP file containing the required files. Make sure to switch to the Server tab to find the required download. Notice the two executables from the Bin folder. 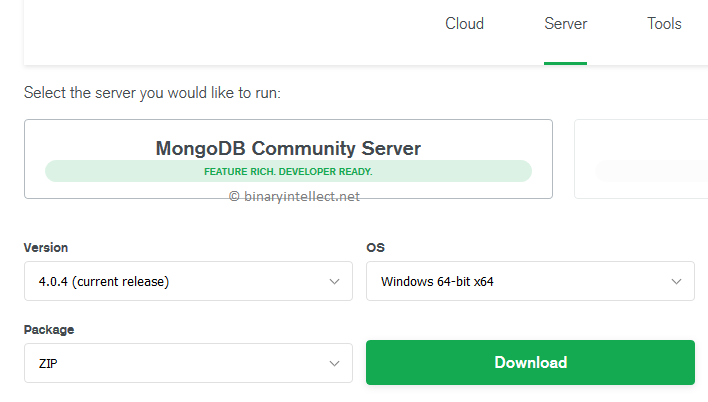 The Mongod.exe is the command line tool that allows you to connect with the MongoDB server. 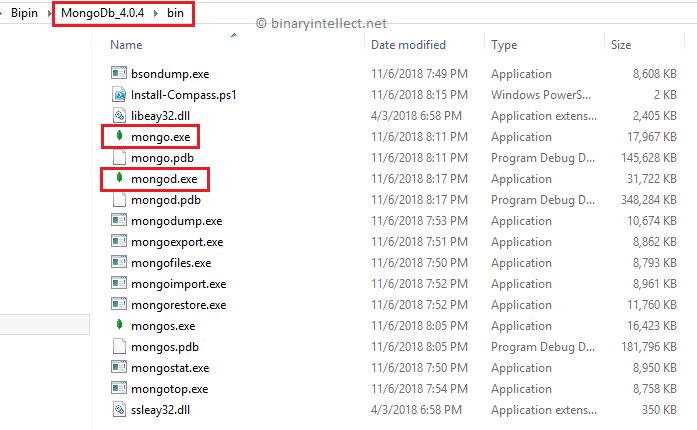 The Mongo.exe is a tool that acts as a client to the MongoDB server and you can use it to execute commands against the database such as CRUD operations. Now that we have the required software installed let's proceed to create a MongoDB database. 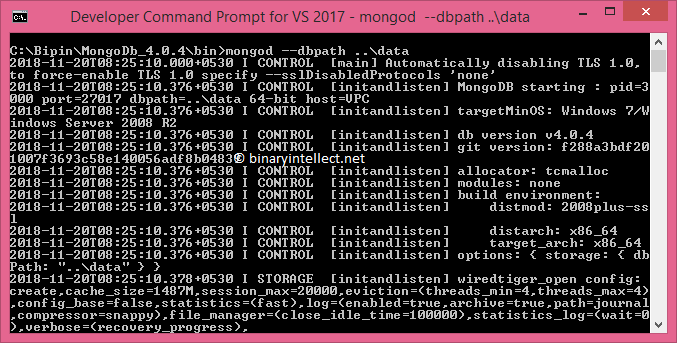 By default MongoDB stores database files under /data/db folder. But you can change this location as per your requirement. In our example we will store our files under \MongoDB_4.0.4\Data folder. So, create the Data folder under MongoDB_4.0.4 folder. The above command instructs the MongoDB to use the specified database. If the database already exists you will be switched to it, otherwise a new database with that name will be created for you. The createCollection command will create a new collection with the specified name. Once created you can add documents to the collection. Now that you created a new database - FirstDatabase - let's perform CRUD operations (Create, Read, Update, and Delete). First of all, we will add some documents to the FirstDatabase. Let's assume that we want to store Employee information into our database - EmployeeID, FirstName, LastName, and Designation. Here, Employees is developer defined collection name (we created it in the preceding section). We add a new document to the Employees collection using the insert command. Add a few more employee documents using the same command so that we can perform the remaining operations. Now, MongoDB won't assign ObjectId to the _id field, instead it will use the value you specified. The first parameter is a criteria that decides which document(s) is to be modified. The second parameter specifies the modified fields. In the preceding example, look for a document whose EmployeeID field is 1 and then we change its Designation field to Sales Executive. You can specify multiple fields in the first parameter if required. The second parameter need not include all the fields, just the modified fields are sufficient. This is the job of $set operator. If you skip the $set operator the whole document will be replaced by the document specified in the second parameter. Just to confirm that update has really happened, issue the find() command as before. You should see the new designation outputted on the console. The remove command accepts criteria for removing data and removes the matching document(s). In the above example we delete an employee document whose EmployeeID field is 1. As before confirm whether the data has been really deleted or not by issuing find() command. As you can see specifying an empty criteria removes all the documents from the Employees collection. That's it for now! In the next part of this series I will explain how to connect to MongoDB from ASP.NET Core application. Till then keep coding! !